I once said "afraid of heights no more" in one of my travel albums. I was convinced I wasn't afraid anymore until I went on top of the Shard and realised that I couldn't look down and felt like I was going to fall despite the the fact that I was surrounded by glass. Since then I decided to "desensitize" myself and exposed myself to heights whenever I got the chance. And then I came up with 40 before 40 list and added Zip lining on it as one way of hopefully conquering my fear of heights. I am really lucky to have family members from the States who are very adventurous, especially my Uncle Greg. Whenever he is home, he is always looking for things to do. So one day when he got bored and wanted to do something fun, I suggested zip lining. I knew that they have already done this in Hundred Islands a week before, but knowing them I was confident that they would do it again. Yes, I had an ulterior motive in suggesting this activity because I wanted to make one of my dreams come true. Call me selfish. I struggled to find a good place to do zip lining. I mean I knew there are really good ones in the Philippines but because my family from the States didn't have much time left, we wanted to do it as local as possible. 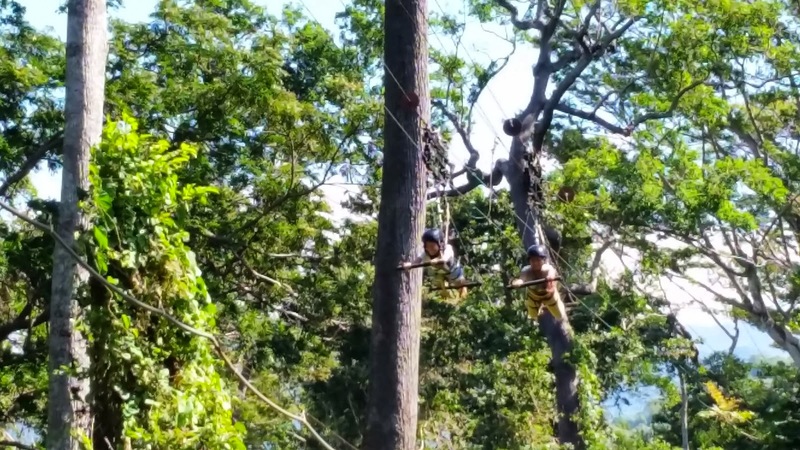 Luckily, I also have an adventurous friend who suggested Treetop Adventure in Subic Bay. This was perfect for us as it's only about 45 minutes away. We arrived at Treetop before 11am on a Friday and it was not busy. In fact as far as I can remember it was just our group to begin with. It was not that bad to get there as there were signs all throughout. Everything went smoothly except for the fact that some of my family members could not decide on which activities they wanted to do, myself included. I originally planned to do just the zipline, but ended up doing two more. 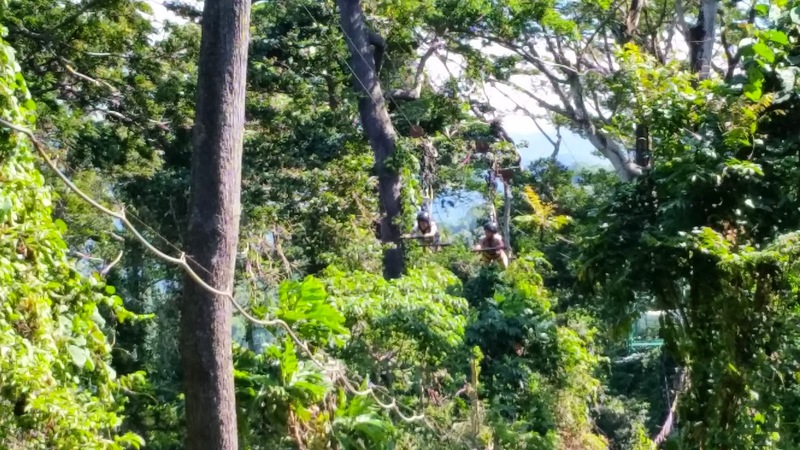 I am going to write about my zip lining experience first. I was confident about this experience because I wanted to do it. Besides I need to tick it off my list. That is why as soon as I was geared up (with harness and a helmet)and ready to go, I knew that this was another dream come true. All of the excitement faded though as soon as I got on top of the station and watched my other family members do it first. Fear took over. I had second thoughts. I asked if I could back out, but they all reassured me that it was going to be fine and that it would only take 30 seconds. When it was my turn to go, I swear to God I almost went into panic attack or maybe I did. I suddenly had palpitations and my legs were trembling. I didn't know how to reassure myself so I just kept murmuring "Oh my God, Oh my God". I know this might be a bit of an exaggeration, but if you are afraid of heights and not used to outdoor activities such this I'm sure you will understand where I am coming from. I had to remove my flipflops in fear of dropping them. I didn't like the fact that you have to climb on a side bar to get on the ride. They were like about an inch in diameter and quite slippery (you can see it on the photo below, the yellow ones on my right). The ride is called Superman ride so you are literally in that position. I can barely remember how I managed to get on it. All I can remember is that I went really stiff and my bottom was raised. The guides were telling me to relax. I didn't know how until I realised that I had harness on and that I was hooked on a wire. As soon as I heard "Okay Ma'am, ready", I held onto the bar really really tight, kept my legs really still and closed my eyes. I'm sorry but I couldn't bear to open my eyes. Just the thought of looking down already made me sick. I was suspended 100 metres high. You might say it's pointless but I will defend myself for being brave enough to even try it. Anyway, the whole trail is 140 metres long and yeah maybe it was 30 seconds back and forth, but it seemed longer than that because I was genuinely scared. I did it with my niece and all the time I just kept asking her if she was okay and if it was really high and if it was finished. And because I was preoccupied with fear I didn't even realised that the ride has stopped until the official photographer asked to have our photo taken. That was the only time I opened my eyes and smiled. Mind you, I was still hanging at this point. I am not sure if the Canopy ride was less scary than the Superman ride. The canopy ride was slower of course and I was seated. However, it was still 100 feet above the ground so it didn't make any difference to me.I was scared just the same. The canopy ride had three stations and it took us at least 45 minutes to finish the whole ride. Our first guide was really helpful. He probably noticed that I was scared so he tried to distract me by asking personal questions which I didn't mind. He also talked about the history of the buildings in the area and the trees as we went along, but unfortunately I wasn't paying attention so I can not remember a single thing. We had to cross a hanging bridge to get to the first station. I am glad that our guide was good at taking photos. I didn't even have to ask him. He joined us on the first two rides but left us on our own at the last station. Yes, I had my eyes closed again the whole time except of course when my photos were being taken. In the middle of the last ride, we hit a tree because it was windy that day. The two guides at the end of the station wouldn't have noticed if I didn't scream because they were both doing something else. I must say that they were less helpful than our first guide. We were told by our first guide to always make sure that we were hooked on the wires and he did this for us all the time. But the two guides left us on our own and when I asked if we had to hook ourselves, one of the guys said not necessarily. I thought that was the end of the adventure but I was wrong. We were then instructed to cross five hanging bridges on our own. Although the hanging bridges looked really safe, I was still scared because I had a bad experience when I was in university. We used to cross hanging bridges in our community placements and one of my classmates made fun of us and started jumping on the bridge. I got really really scared because we were crossing a river. Since then I hated hanging bridges. Anyway, my niece and I didn't have a choice so we went on our way through the hanging bridges. No instructions were given apart from turning left and then follow the trail until we see the information area. I had to stick to the safety instructions given by our first guide, so I made sure that we were hooked on the wire. The only problem was that the wire was too high for us. I had to tip toe and pull the wire with my index finger, and then my niece hooked me up. I did the same for her. My Uncle and two cousins did the whole package so they also got to do the Tree Drop Adventure and the Silver Surfer. They all said that the Tree Drop was the scariest of all the activities. Even our normally brave cousin got scared. I couldn't take a decent photo as I was using an old camera and I was against the sun. Besides, the drop only took seconds. They were on the ground before I knew it. My cousin said that the Silver Surfer was not really scary although it rocked them back and forth 10 to 80 feet high. He only got scared because my Uncle kept moving. All of us did the Trekking Adventure. It was about an hour long walk in the forest including some basic survival training. Our guide Alfred did the survival training for us. He taught us how to get water from what it looked like a small branch from a tree. The water tasted sweet but it was not much. He had to cut it again for the next person. Alfred also showed us how to make a cup, spoon and fork and a rice cooker using bamboo. The most interesting part of the whole demo was the making of fire out of a dried bamboo. My brother attempted first but he failed. So my cousin had another go and succeeded. All in all it was a fun adventure. I still can not say if I have conquered my fear of heights this time but I can guarantee you that it is worth it. The only complaint I have is their photo booth. Yes they took very good photos of us and it was very tempting to buy, but they were expensive -P250 per photo. For 2 copies of 4x6 and their 6x8 combo, you can only choose one photo. I mean what are you going to do with multiple copies of the same photo? Perhaps they have to add another package where you can choose different photos at a cheaper price. They probably will make more money. Otherwise, it was a very good experience. Summer in the Philippines is almost here, so if you are looking for a real adventure that is not too intense, Treetop Adventure is for you. You can check their packages here.